Shirt: Zara | Jeans: Zara | T-shirt: H&M | Bag: Rebecca Minkoff | Sneakers: Vans | Sunglasses: Ray-Ban | Watch: Michael Kors | Necklace: Tiffany & Co. | Earrings: Tiffany & Co. Distressed denim is having a moment in fashion. Celebrities, models and trendsetters are all wearing their best distressed blue jeans. I love how rips and frays add texture and interest to an outfit in an effortless way. 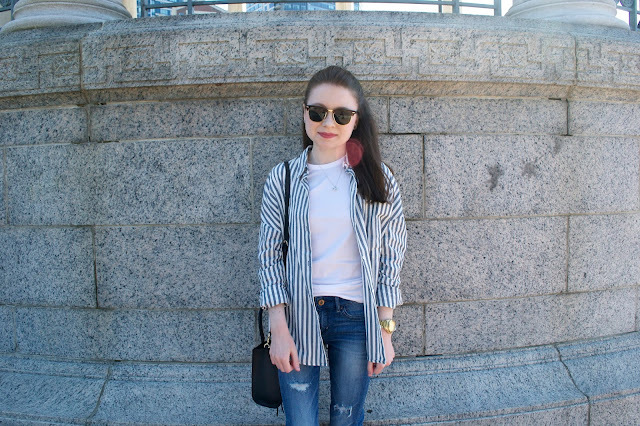 When I found this perfect pair of ripped jeans at Zara, I knew I couldn't leave them behind. Everything about them works, from the wash to the placement of the rips and frayed hems. I paired my jeans with a simple white tee from H&M and a Parisian-inspired striped shirt from Zara. I feel like a French artist when I wear it. I slipped on leather Vans and went with my Rebecca Minkoff bag to add a pop of black to the outfit. I really like how white, blue and black look together. I accessorized with my Ray-Bans, Michael Kors watch and Tiffany jewelry to complete the look. 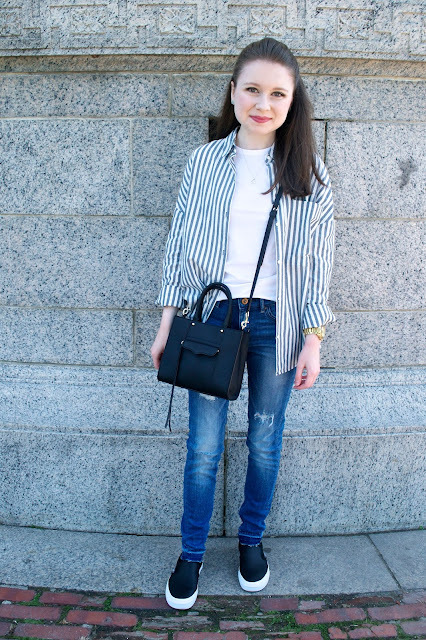 I think ripped jeans and striped shirts will be street style staples for a long time.